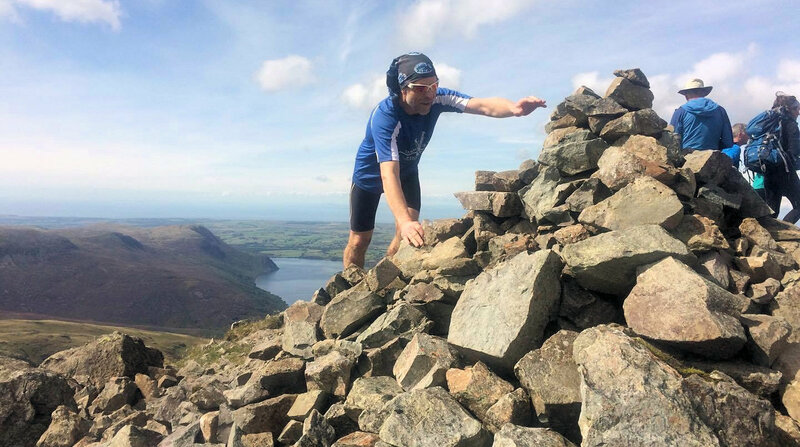 At 22:00 on Saturday 12 August I set off from Moot Hall in Keswick on the first leg of the BGR aiming for a 22 hour round, my running support for this leg freshly back from holiday the night before was Alex Fawcett. Weather conditions were almost perfect, hardly a breeze and clear skies as we set off on our first climb of Skiddaw, I just wore a T shirt which I was glad about although the cloud was down on the top which made finding the correct route a little longer. Great Calva was ok only hiccup was losing site of the trod for a while so wading through deep heather and bogs slowed us up. Climbing Blencathra was great, we got to the top and as I touched the summit the Perseid Meteor shower I had heard about shot across the sky, after this awesome sight we descended to the end of the leg at Threlkeld. My ground support team was Jacko Fawcett and Juliet and they were ready with cups of tea and food, also present at the start and at this checkpoint Gary Bastow. After a quick top change food and watering my new support runners Pete Pumpkin Chapman and Spike Ambrose Smith set off with me on Leg 2 up Clough Head, the cloud was down on the Dodds, which again slowed progress a little but when it lifted we made good progress, after ticking off most of the peaks we started our ascent of Fairfield as the sun started to rise making the views around us spectacular. Pumpkin and Spike did a great job, keeping me fed and watered and entertained all the way to Dunmail Raise for the end of the leg. 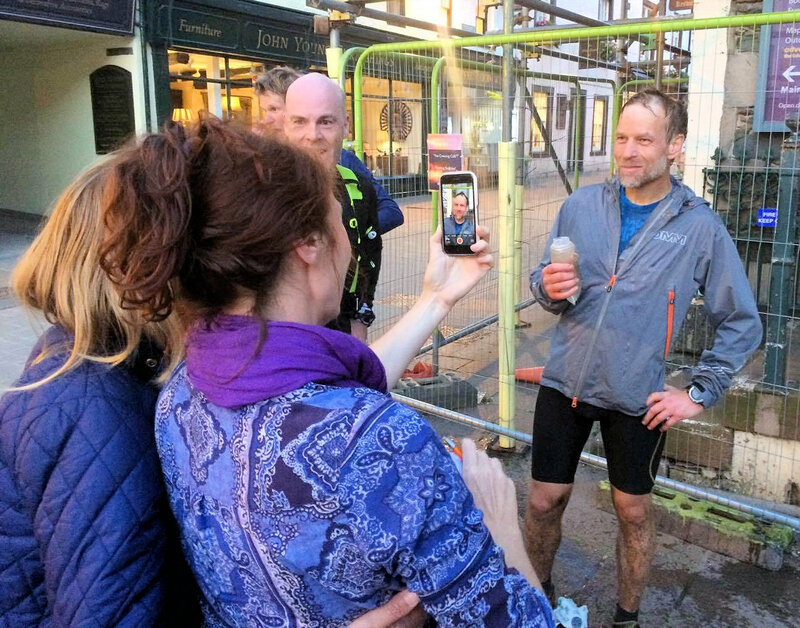 Again the fabulous support was waiting with a good feeding and tea, along with Gary Bastow and Nigel Bower who brilliantly stepped in last minute to help with transport of support runners and was at the checkpoint from 5.30 am, he also takes great photos! 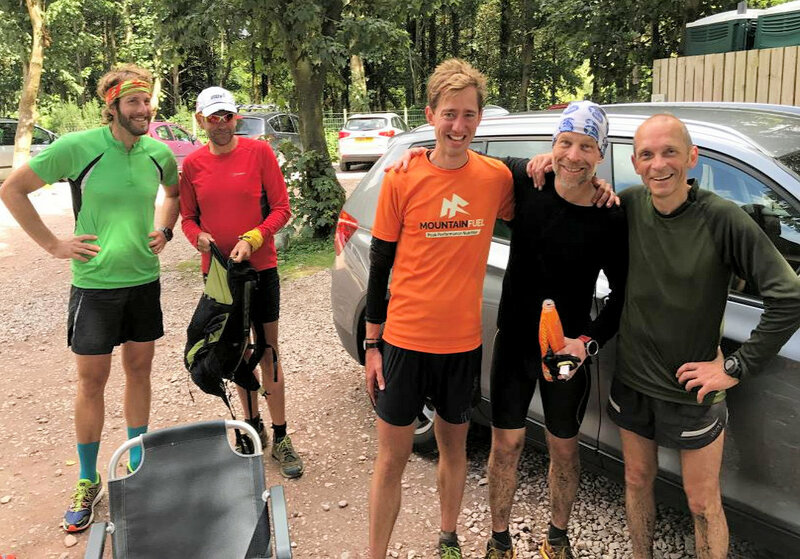 Leg 3 support running team was with Casper Kaars Sijpesteijn and Alex Fawcett, after a 10 minute stop (shoe change) we set off up Steel Fell in the rising sunshine. Just after half way up I realized I had left snack bars at the bottom, Casper shot off down the hill, retrieved them and caught us back up again before we reached the top! At the top I asked if he could retrieve my sunglasses, his answer was swift and sweary (no). 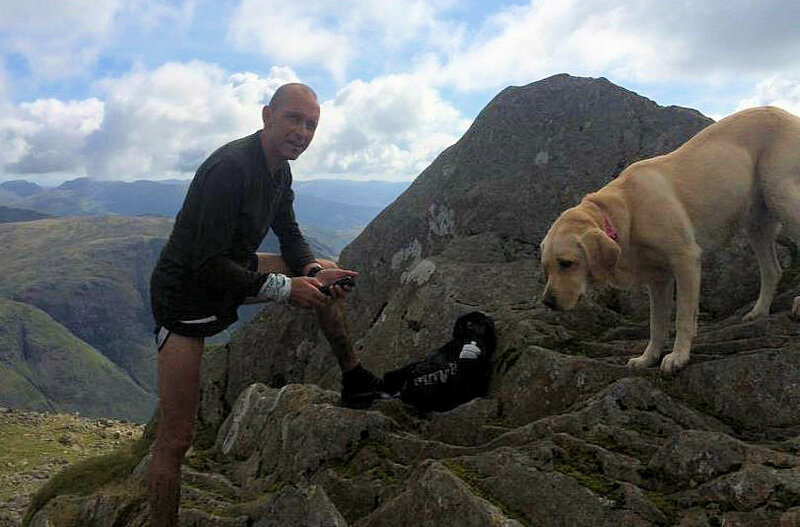 Casper had done leg 3 the day before with Gary Scott on his BGR and had also completed an incredibly fast BGR 17 hours 57 minutes with his wife Katie earlier this year so knew the route inside out. Leg 3 has stunning scenery and has some big climbs, one of which around the mid-way point is Bowfell, at this point John Bull and Poppy the wonder dog after camping on the hills overnight they waited for us with a Chow Mein Noodle, it was quite disgusting to eat but forced down around half before saying goodbye. The rest of the route went well, Scafell Pike to Scafell we went the same way as Alex had used on his round up Lords Rake and the West Wall, before a fun descent into Wasdale Head. 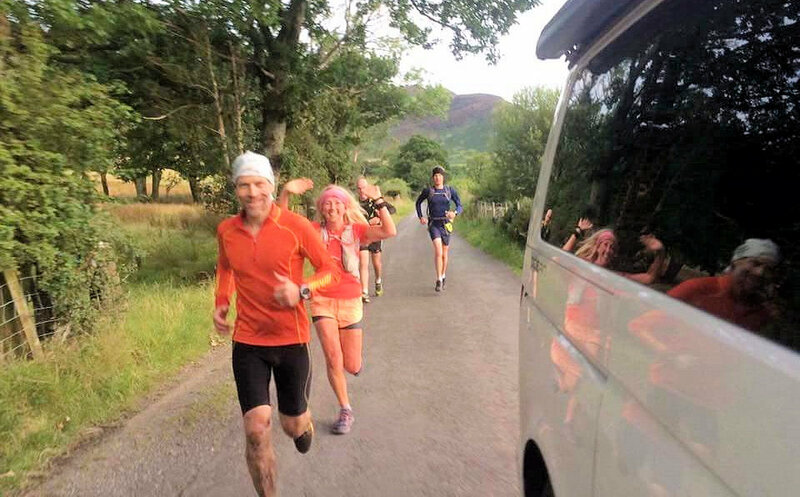 At Wasdale I was greeted by an increasing posse now including Anne Bower, Claire Jameson, Paul Shears and Mark Dalton as well as the rest of the fab crew (Juju, Jacko, Nigel). The team gave me a huge boost every time I saw them, Juju looking after me brilliantly. A new running team of Paul Shears and Mark Dalton joined me for Leg 4, I had run leg 4 with both before on Alex’s round and was chuffed to have them agree to do it for me also as they are brilliant motivators and know the route so well and took care of all my gear and kept a close eye on me as at this stage was feeling fatigue. In my opinion Leg 4 offers the most spectacular views and it didn’t disappoint, with clear skies and sunshine the vista around us was breathtaking. 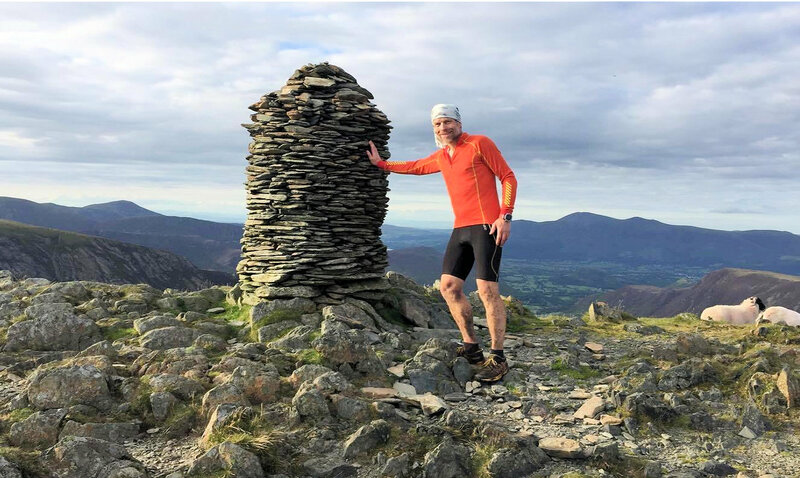 After the long slog up Yewbarrow, came Red Pike, Steeple, Pillar before the ascent up Kirkfell at the top of which I threw up. After munching down quiche and bananas we started the last big climb of Leg 4, Great Gable. Paul and Mark entertained all the way and looked after me well cheering me on and even telling ramblers around me what I was doing giving me even more of a boost when they clapped and cheered. Leg 5 – New Running support from Captain James Boddy, Claire Jameson and Dave (Terry) Ritson all itching to get me to the finish. Up Dale Head in the afternoon sunshine was glorious, we had some pop trivia as we ascended and discussed James’ dislike of a popular pop band. 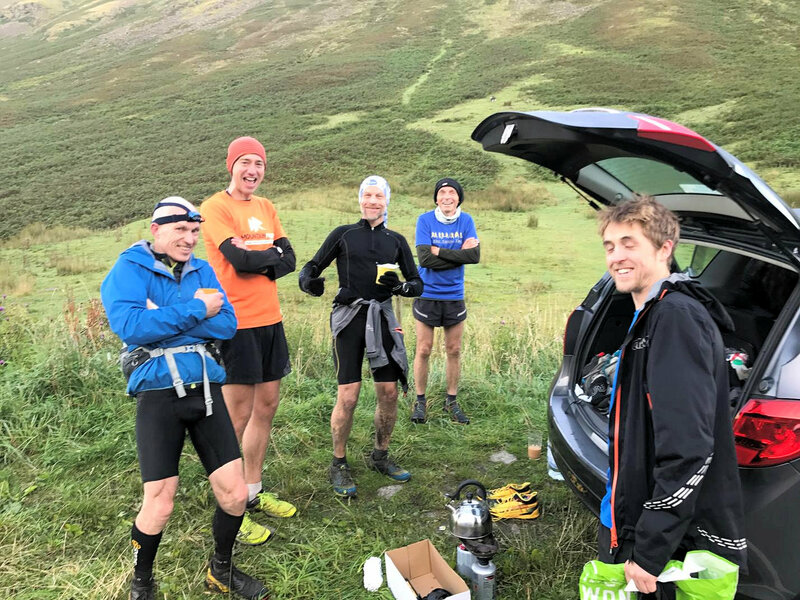 The last three climbs soon accomplished and then descending down to Newlands Valley and the road run back to Keswick where the team kept me motivated and encouraged me to keep running when quite clearly I was done in, well done guys! Claire Jameson, Dave Ritson & James Boddy. 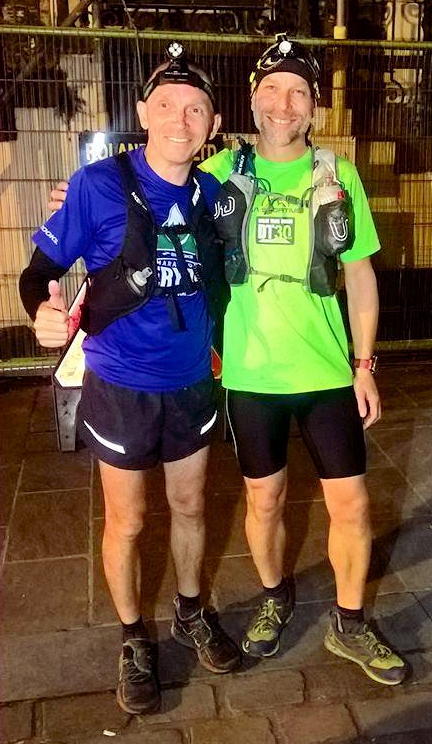 Moot Hall Keswick – Finish at 20:55 (22 hours 55 minutes) Rest time 51 minutes. The run into Keswick is very emotional, such a long Journey and many ups and downs, the Bob Graham Round is the best running experience I have ever had and feel incredibly proud to have completed it and I could not have achieved this without the fantastic support team around me. I thank you all x.